11TH BUNN: ...If you want to vote not guilty, then do it because you're convinced the hoomin is not guilty - not because you've had enough. And if you think he's guilty, then vote that way, or don't you have the guts to do what you think is right? Credit: Detailed analysis of the deliberation were found here. Oh Great! 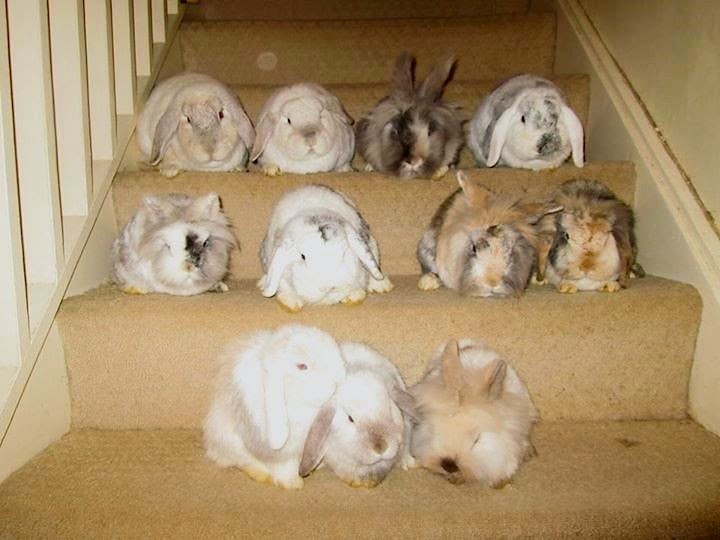 Right there is any hoomin's worse nightmare .. jury of "peers"? Oh. Dear. It does conjure images of Henry Fonda passionately pleading the case for hoomins, but this looks more like an outtake from "Night of the Lepus" or a showdown from an old western. *shiver* Beware, Chelsea! Looks like justice works swiftly in Bun Town! Brava, Chelsea! This is a miraculous feat. My hat is off to you. Hard to look at all that disapproval though. Maybe I should make a hole in a paper plate. This is really scary stuff. Even crime drama on TV is way too much for us LOLs (little old ladies), but this...I am making a dive for under a piece of the furniture. I'll be staying there for a few days. RG, I think this is what one would have to call "a jury of the peerless."